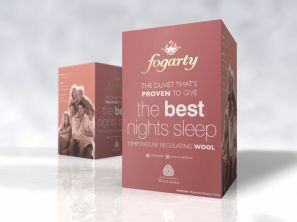 This Fogarty Wool duvet carries the Woolmark Seal of Approval. Perfect for all year round, the wool filling regulates your body temperature, keeping you cool in summer and warm in winter. Wool fibres work by breathing naturally, transfers and evaporate moisture quickly and therefore, reducing the users heart rate and ensuring a more comfortable and restful sleep. Wool is naturally anti-dust mite, anti-bacterial and anti-fungal.